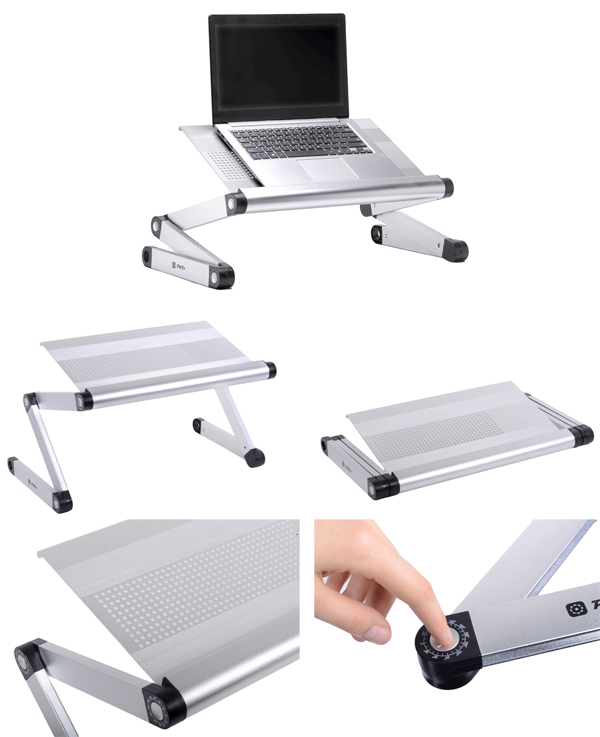 Laptop Table helps reduce the operating temperature of your laptop and allows for steady airflow around it. It uses passive cooling methods to distribute air quietly and evenly under the base of your laptop or netbook. Wherever it is used - be it a desk, sofa or your lap - Pwr+ table provides a most comfortable typing angle and reduces neck and shoulder stress thanks to its unique design and shape. And it is a perfect breakfast tray also! Multifuctional & Ergonomics Design Dual Layer Tabletop. Compact, foldable and easy to carry - use it any way you want it. * Suitable for 7-17" laptops - Adjustable auto-locking joints with 360 degree roatiation.